What makes NuMark Markers better than the rest? We focus on the needs of industry professionals not typical consumers. Our customers tell us that NuMark Markers out perform typical “consumer” grade markers and the reason is simple, industrial grade materials and industrial quality. Need more ink – Just push down on the tip, need more markers – ORDER today! 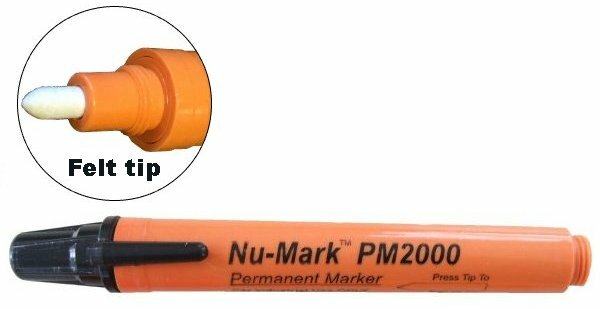 Nu-Mark PM2000 Permanent Markers: The ORIGINAL! Our industrial quality Permanent markers are designed for professional use. These markers contain our proprietary ink formula which includes a fast drying solvent carrier and dense commercial dyes designed to leave long lasting marks on most surfaces. Unlike typical “office supply” markers ours have a very long shelf life and will out-write many of the cheaper markers 5 to 1. *PM2000 contains Xylene. For an Alcohol based alternative try our NEW XF5000 Xylene free marker! There are as many Industrial Permanent Markers as there are uses for them. Each design has characteristics that satisfy specific needs. If you haven’t found the ideal marker for your application, don’t give up, try our Nu-Mark Marker. Many users in the Northeast have been using our markers for nearly 40 years! Attention Aerospace Manufacturers, click here for a copy of our Detrimental Materials Report. NOW includes Durable Synthetic DOUBLE Bullet point tip! Same specifications as the PM2000 but with 30% More Ink. A tremendous value for our customers who want a marker that lasts even longer. Please note that these markers not intended for occassional use. Not available for sale in California. For replacement TIPS see RT-6000 replacement tips above. Most paint markers look the same but with different labels. Many of those paint markers even have the SAME paint inside but at different volumes. So if your current paint marker is not working for your application it is difficult find a better one. UNTIL NOW! Our Paint markers are our own unique design with our own unique paint formula designed to impart distinct colors on most surfaces. Our larger size is easier to hold and our bright colored barrel is easy to find. Our Mark-Off marker is great for making marks that you intend to remove at some point. Our special blend of water soluble Ink wipes off of most non-porous surfaces with soap and water. Replacement TIPS for Mark-off markers. Replacement TIPS for Paint-This! markers.